For a list of local practitioners that we collaborate with, see below. If you are looking for an osteopath outside of the Brighton & Hove and Henfield areas, please scroll down towards the bottom of the page. At South Downs Osteopathy we are keen to provide our clients with the tools necessary to manage their health and fitness. We are pleased to recommend the following professionals operating in Brighton & Hove, Henfield and Haywards Heath, whom we may suggest you visit as an adjunct or an alternative to osteopathic treatment if deemed appropriate for your individual needs. Many problems with posture, bodily alignment and mobility can involve the foot and ankle. If we find that you have poor foot mechanics or painful foot conditions that affect the way you use your body, we may suggest a visit to a podiatrist. My Henfield clinic takes place on Thursdays and Fridays within db Foot Clinic. Owner, David Bremner, and his team of podiatrists provide a very popular and professional service within the village. Because I am on-site both days, I am able to directly liaise with Ann Taylor and Emma Bishop, both of whom are friendly, knowledgeable podiatrists who are also available to see patients on Thursdays and Fridays respectively. db Foot Clinic are able to offer a full range of chiropody and podiatry services, from routine corn and callus removal to biomechanical assessment and orthotic fitment. To book an appointment, call 01273 493467. Anyone who enjoys taking part in sports or exercise knows the familiar ache of overworked muscles. Keen athletes of all abilities may also find a regular sports massage keeps their muscles in good condition. We may recommend visiting a sports massage therapist to compliment osteopathic treatment once we have addressed any underlying structural or functional issues, especially if you take part in regular physical activity. Kristina Banner is a highly experienced massage therapist who is able to provide sport, remedial and therapeutic massage, as well as reflexology. Kristina is available for appointments at db Foot Clinic in Henfield, on Tuesdays and Wednesdays. Please contact the clinic directly on 01273 493467 for bookings. All treatments are carried out in a confidential, warm and nurturing environment to maximize deep relaxation; one of the main pleasures and benefits of good massage/reflexology. Professional organic massage waxes are used containing blended aromatherapy oils to suit your needs and preferences for certain aromas. Kristina also teaches yoga and is currently running beginners' classes in Partridge Green. She keeps class sizes to a minimum to ensure she can give every student the attention they need. People who come to us with symptoms associated with a sedentary lifestyle may well be recommended to increase their level of activity as part of the management of their condition. Exercising badly can be detrimental to your recovery. We may therefore recommend a consultation with a personal trainer to help you formulate and stick to an exercise plan. You may find a personalised regime more beneficial than just signing up to a gym. Tegan Simmonds runs FitAz personal training, based in Brighton & Hove. Disliking the gym environment, Tegan prefers to run sessions outdoors or in your own home and aims to provide fun, varied training sessions. Tegan can fit into your schedule, training as early or as late as you want and, with a certificate in Sports Nutrition, can help you optimise your diet to keep in shape. You are what you eat! Maintaining good physical health requires the right balance of nutrients to allow the body to repair itself. Excess weight can put undue strain on your body. If you want to lose weight, improve sporting performance, have digestive problems, low energy or other long-term health concerns, you might want to consider a visit to a nutritional therapist for a tailor-made nutritional programme to meet your individual needs. Nathalie Sansonetti is a qualified Nutritional Therapist based in Hove, who has a particular interest in fitness and sports nutrition, children's nutrition and weight issues. In addition to those listed above, we regularly meet with other practitioners in the local area in order to provide our clients with a broad variety of health and fitness professionals working from different locations across the city. Ross will happily recommend other suitable professionals to you during a consultation, who have not yet been added to our online list or who may not have a website for us to provide a link to. The list below is not exhaustive. Ross only recommends osteopaths he has personally worked with or received treatment from and knows that they do an excellent job, however there are many other osteopaths throughout the country. 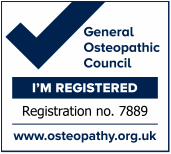 For a full list of UK registered osteopaths, visit the GOsC website. Our recommended osteopaths are listed alphabetically by region. Please check back regularly for updates. Barefoot Osteopath, Margaret Sinclair, runs clinics for human patients in Brighton & Hove and can provide osteopathy, cranial osteopathy and sports injury therapy. Margaret also provides osteopathy for animals, specialising in (but not exclusive to) dogs and horses. She can travel to locations in London, Surrey, Sussex, Kent, Middlesex, Buckinghamshire, Berkshire, Hertfordshire and Essex for equine patients and throughout London for canine patients. Humans - Call 07565 141312 or e-mail info@barefootosteopath.com for an appointment or more information. Body Foundation Osteopaths are based in Paddington, London. Osteopaths Emlyn Lamburn, Diana Leake and Austin Plunkett provide safe, effective, hands-on treatment for pain related to movement and posture. Treatments provided include osteopathy, sports massage and classical massage, all of which are helpful for conditions such as back pain, stiff joints including shoulders and knees, neck discomfort, and many other aches and pains.